This is just the beginning -- of how education should be changing, by incorporating new teaching methods like this white board, fast drawings and interesting talk -- and why traditional schooling is not working. This is done with RSA Animate. I love it. I am so entertained and learning at the same time. 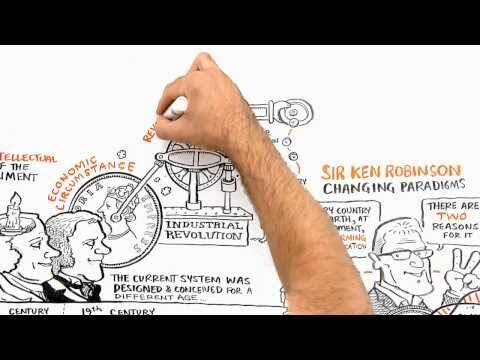 Ken Robinson does a fabulous job on this video. See what you think. My 15 yo son watched this with me and said "Send me that URL, that is fantastic." He was homeschooled until 6th grade when I had to go to work for a couple of years. He is a deep thinker and so very creative. Hi there, I've just found and been reading your blog. I love Sir Ken Robinson's message and it's so true! I'm not a homeschooling Mum but am aware that I might need to at some time in the future and it looks like a daunting task! My 5yo is about to start school in the new year (we start in Jan in Australia) and they're already concerned about his "non-conformist" behaviour. Which really means he chose to play lego instead of sit and listen to a story. Inside I'm thrilled that he has his own mind and he's a deliciously curious and caring boy - just needs stimulation and creative teaching! I love his comments about the IQ test (the paperclip challenge). Why do we squash that? !